More fun on the Michael Vick front, following the shooting at his own birthday party a few weeks ago, his probation won’t allow him to leave the state. That means he couldn’t make his own golf tournament in Atlanta, or a youth football camp he’d already been paid to attend. 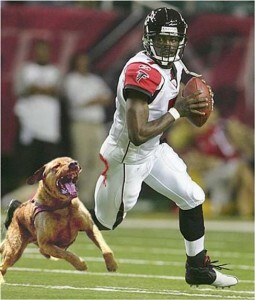 I love the Vick story, simply because I’m a fan of things I’ve never seen happen before. Vick has turned his life into such a train wreck/grease fire/clown autopsy, it’s hard to look away. Yeah. To start with, what the Hell kind of parents send their kid to a football camp because Michael Vick is going to be there? The kind that CPS should be investigating, that’s the kind. Here’s my favorite quote, the guy who runs the camp was obviously upset that after he agreed to pay Vick $4000, he didn’t show up. I’m not sure exactly how either of those words apply to Vick, unless “Integrity” is the name of one of the banks suing him for defaulted loans, and “character” is used as a general description for felons who aren’t even smart enough to get away with marijuana. — Reid Kerr believes in second chances. Third and fourth? Not so much. This entry was posted on Monday, July 12th, 2010 at 9:45 am	and is filed under Sports. The entry is tagged under You can follow any responses to this entry through the RSS 2.0 feed. You can leave a response, or trackback from your own site. I liked reading your blog ~ thanks for posting such useful content.